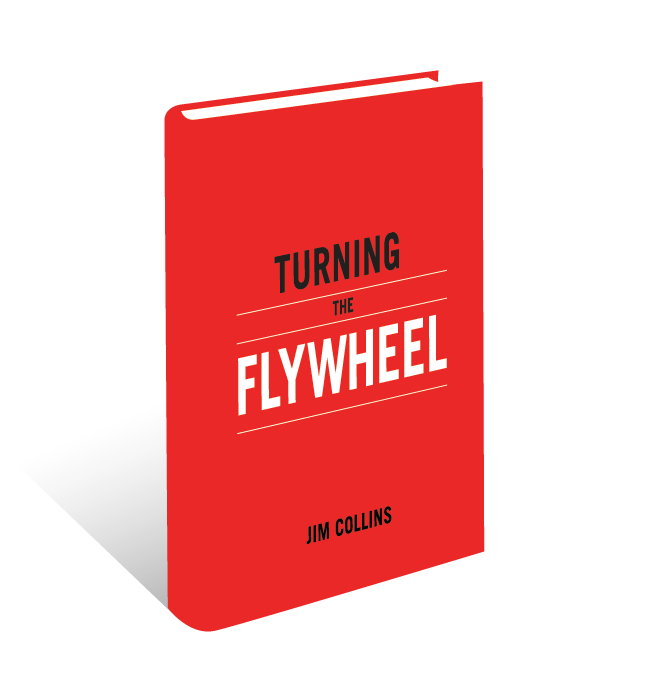 This monograph grows out of two decades of Jim’s observations of how leaders have employed the flywheel concept to build and accelerate momentum. Drawing upon cases from massive growth corporations like Amazon to small companies, nonprofits, hospitals, and even K12 schools, this work breaks new intellectual ground. It also gives practical guidance to help leaders crystalize the components in their specific flywheels—this is the key to harnessing the full power of the flywheel effect. This book addresses a single question: can a good company become a great company, and if so, how? Based on a five-year research project comparing companies that made the leap to those that did not, Good to Great shows that greatness is not primarily a function of circumstance but largely a matter of conscious choice, and discipline. This book discusses concepts like Level 5 Leadership; First Who, Then What (first get the right people on the bus, then figure out where to drive it); the Hedgehog Concept, and the Flywheel. 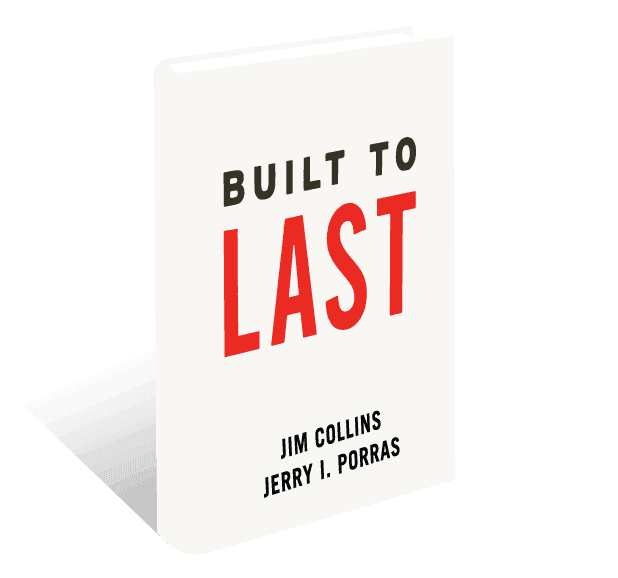 Coauthored with Jerry Porras and based on their research project at the Stanford Graduate School of Business, this book investigates the question, Why are some companies able to become and remain visionary through multiple generations of leaders, across decades, and even centuries? Among the findings are Preserve the Core/Stimulate Progress, BHAGs (Big Hairy Audacious Goals), and the Genius of the AND. 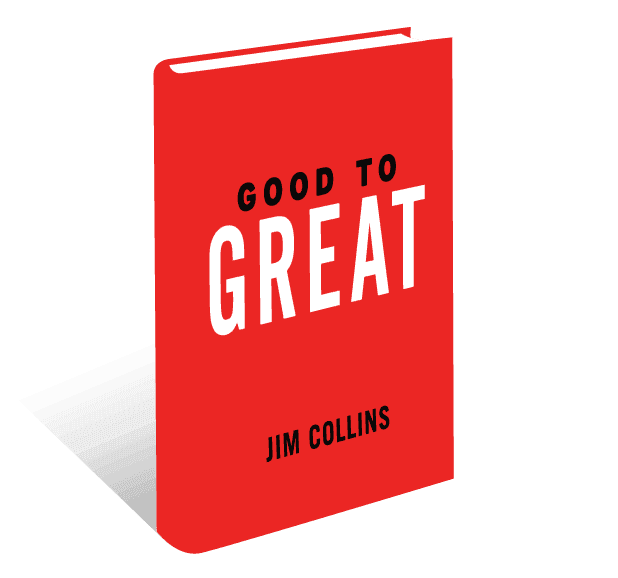 Like Good to Great, Built to Last compares great companies to good ones during specific eras in history, asking, What systematically distinguishes the great from the average? Great by Choice answers the question, Why do some companies thrive in uncertainty, even chaos, and others do not? 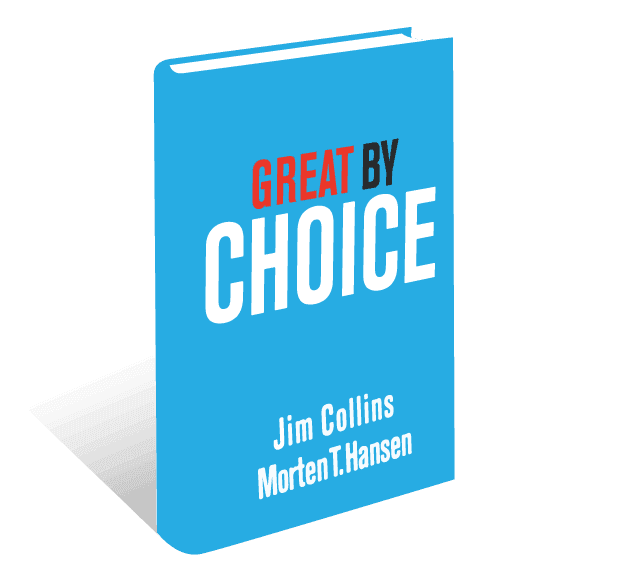 Based on nine years of research, buttressed by rigorous analysis, and infused with engaging stories, Jim and coauthor Morten Hansen enumerate the principles for building a truly great enterprise in unpredictable, tumultuous, fast-moving times. The findings in this book are contrarian, data driven, and uplifting. This monograph sprang from the realization that the Good to Great concepts have use far beyond business—in government, nonprofits, schools, and just about everywhere else. 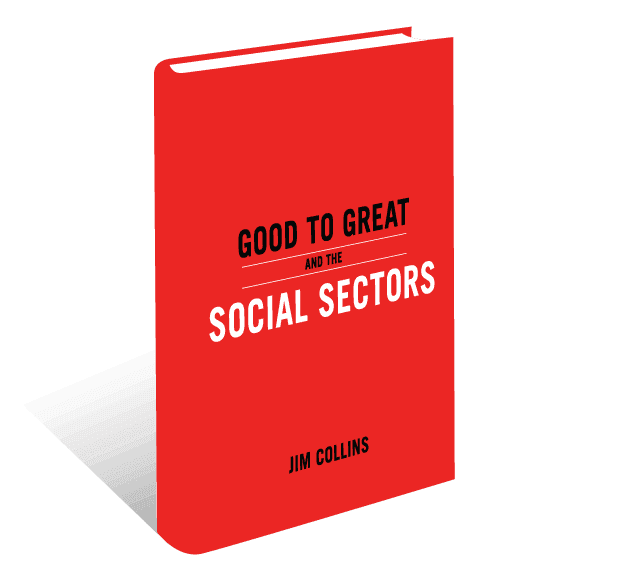 The monograph rejects the idea that the social sectors should operate more like business and shows how the Good to Great concepts can be successfully adapted to arenas in which success is not measured in economic terms. 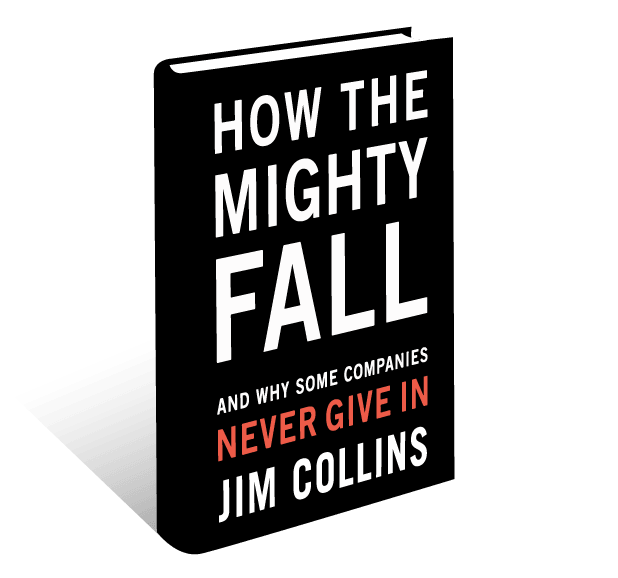 How the Mighty Fall presents the well-founded hope that leaders can learn how to stave off decline and, if they find themselves falling, reverse their course—in part by understanding the five step-wise stages of decline uncovered in the four-year research project behind this book. Every institution, no matter how great, is vulnerable to decline. Anyone can fall, and most eventually do. But decline, it turns out, is largely self-inflicted, and the path to recovery lies largely within our own hands. We are not imprisoned by our circumstances, our history, or even our staggering defeats along the way. As long as we never get entirely knocked out of the game, hope always remains. The mighty can fall, but they can often rise again. 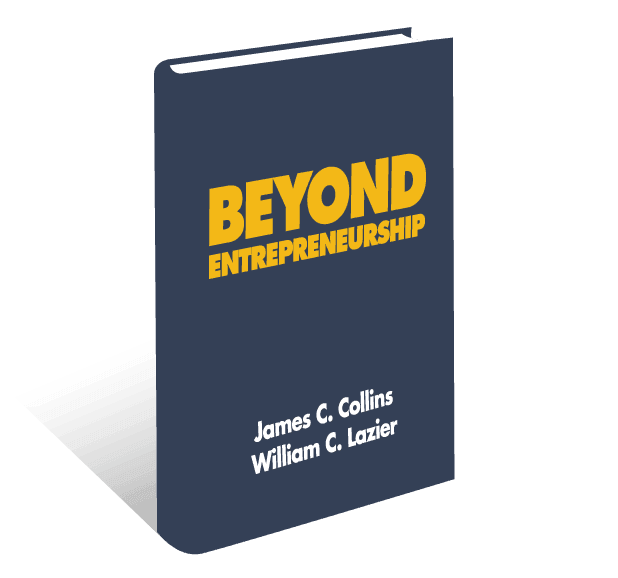 Beyond Entrepreneurship is a roadmap for entrepreneurs and leaders of small-to-mid-sized enterprises who want to build enduring great companies. It provides conceptual frameworks and practical guidance for becoming a great leader, setting a compelling vision, articulating an effective strategy, and achieving consistent tactical excellence. This, Jim's first book, was coauthored with his mentor Bill Lazier. The foundation of all ideas generated by Jim and the team is supported by years of research.